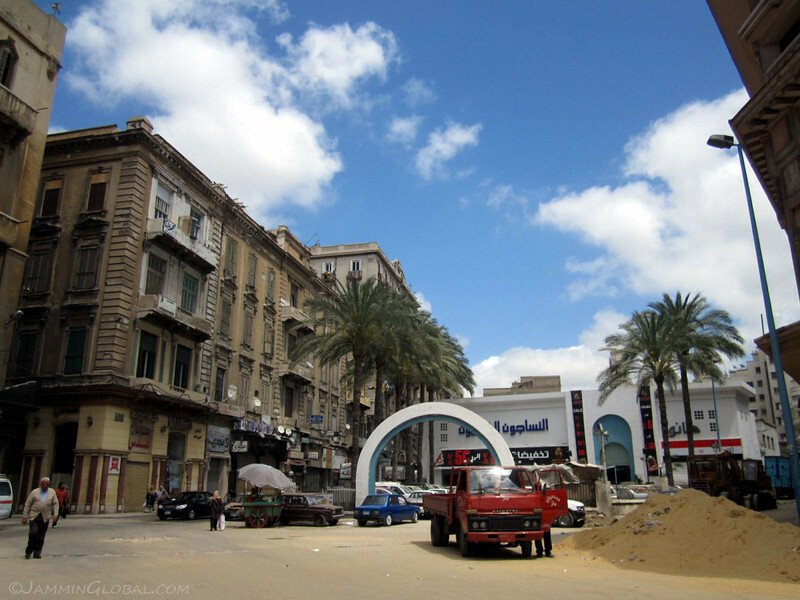 I only spent 2 days in Alexandria as I had to get to Cairo quickly to sort out my visa for Sudan, which was reputed to be quite complicated. Plus, the Egyptian immigration officials only gave me a 72 hour transit visa compared to one month for the Dutch boys; talk about discrimination against developing countries. The Egyptian embassy in Paris said it would be no problem for me to get a one month visa on arrival. As expected, there isn’t clear communication between the foreign ministry and the immigration department. 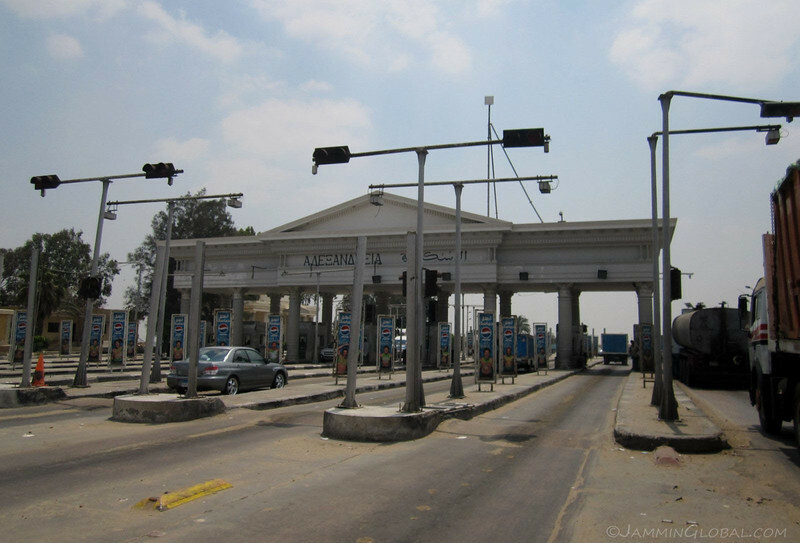 I had a quick look around Alexandria and then headed down the Desert Highway to Cairo. Alexandria is famous in history for its great library and lighthouse, both of which don’t exist today. There’s a brand new modern library, but I wasn’t so keen on visiting it during my short time there. 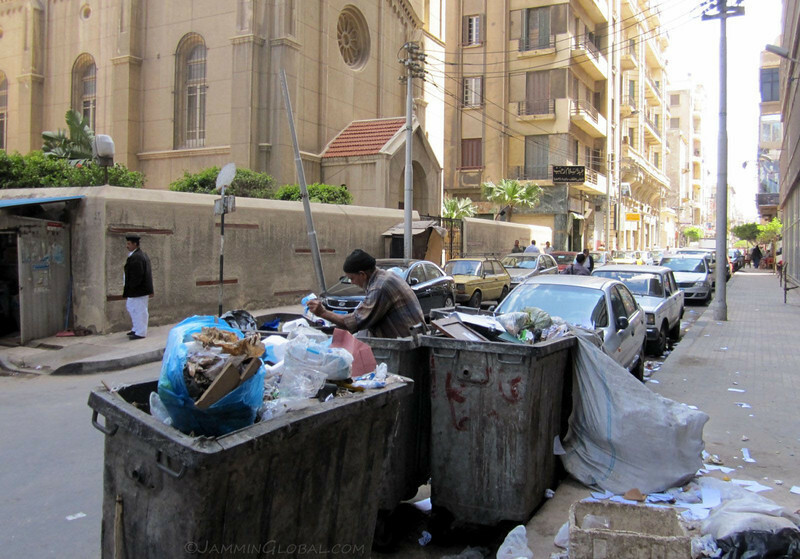 Welcome to Alexandria. 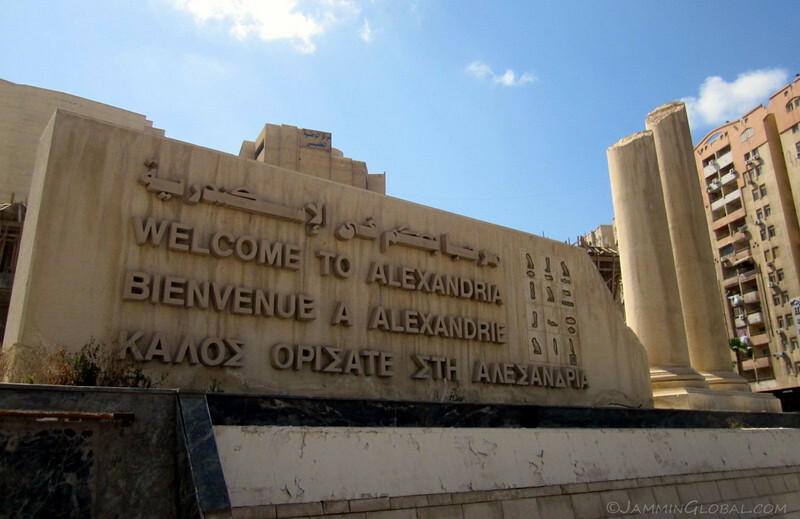 The five languages on the sign representing Egypt’s past: Hieroglyphics of the Pharaonic Age on the far right; Arabic, representing the spread of culture from across the Red Sea; English, from their British colonialists; French, from Napoleon’s incursion and Greek, for the initial establishers of this city, back in 331 BC, as a port in their empire across the Mediterranean. Even though the city was founded more than 2,000 years ago, it’s been inhabited ever since and has changed with the times. This view characterizes the 20th century vision of towered apartment blocks for their efficiency in space, while neglecting the design’s flaws in blending in with the landscape. I walked across this bridge to buy a Mobinil SIM card and wondered how this scene looked when the river was clean and blue. 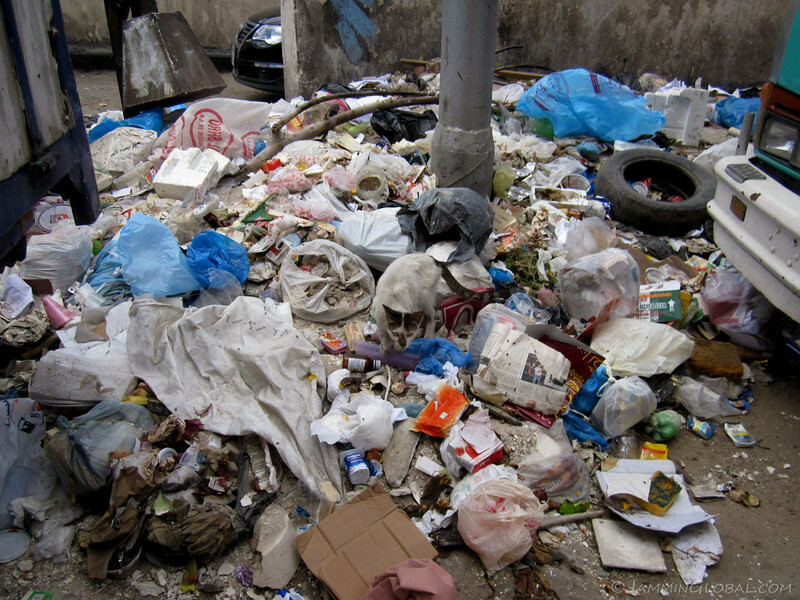 Humankind has taken advantage of rivers and dumped the sewage of our societies in there. This is not an uncommon site in most developing country cities, such as my hometown of Chennai, where we have the Koovam River with its fragrance of fresh sewage. Egypt’s currency, the Egyptian Pound, denoted as LE (French for livre égyptienne). With an exchange rate of USD $1 = LE 5.95, this LE 50 note is worth $8.40. The name and its symbol reflect colonial European influences in Egypt: a lasting French influence after Napoleon’s three year control of the region around 1800 on his way to India and the more recent influence of being a British protectorate in the early 20th century (to protect their access to India). The Egyptian Pound was initially pegged to the British Pound and then switched to the US Dollar (reflecting changing global superpowers) before being floated under tight controls. 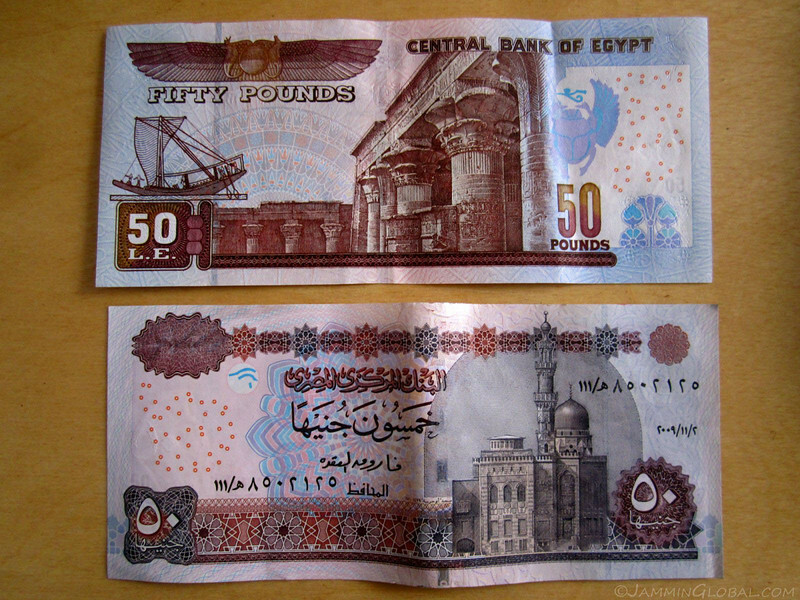 The front of the notes feature Islamic buildings with the value denoted in Eastern Arabic Numerals (Arabic script) and the reverse features Ancient Egyptian motifs with the value denoted in Hindu Arabic Numerals. What can be confusing is that Europeans and Americans refer to the modern numbers as Arabic numerals (because they were introduced by Arab merchants in the 10th century), but for the Arabs, these numbers are known as Hindu numerals, because it was introduced to them from India much before that (yes, the zero was conceptualized by Indians). 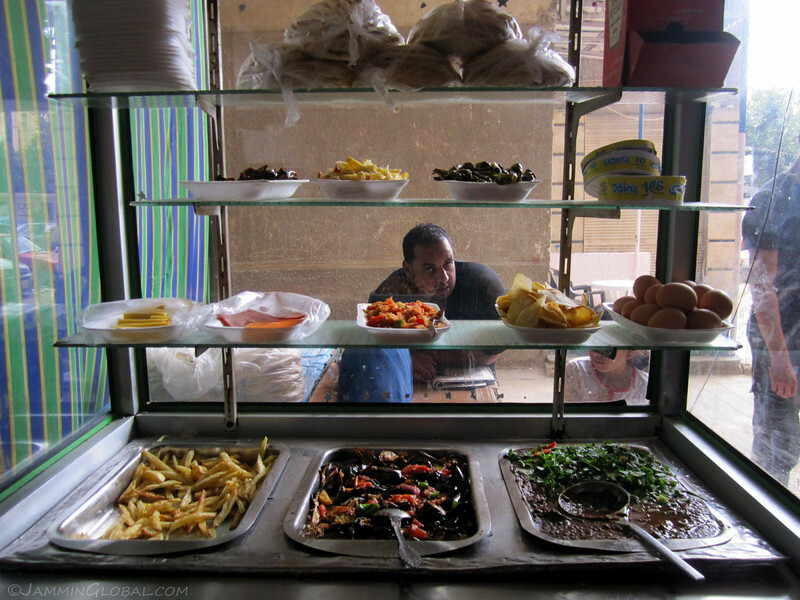 I wandered with the Dutch boys until we found this hole-in-the-wall cafe serving up fresh falafel for breakfast. 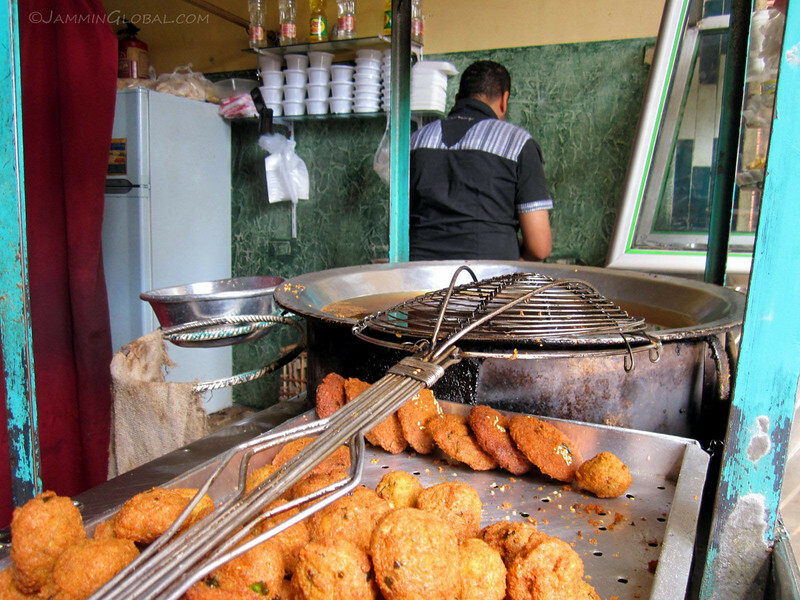 Falafel is ubiquitous across the Middle East and is a fried patty or ball of chickpeas (garbanzo) with other beans, herbs and spices. It’s usually very cheap and enough food for 3 breakfasts cost just LE 4.50 (75¢). Falafel is said to have originated with the Christian Copts of Egypt as a replacement for meat during Lent. These days, it has spread around the world for that same purpose and who doesn’t love a fried snack? The cafe had some other typical food such as fuul (fava beans), roasted eggplant and french fries. Boiled eggs and pickled vegetables were also available. I wandered into the city in search of the Immigration office. I was told it would be no problem to extend my visa there. However, the lady behind the counter threw a fit and told me I had to leave the country and enter again with a new visa. Hmm, I couldn’t go to Libya (the war had broken out there). I wasn’t going to enter Israel, in case that affected my Sudanese visa and Jordan was too far away. While standing in line, a travel agent told me not to worry about it and said immigration officials hardly looked at the date when you left the country and if they did catch you, a small fee (bribe) would suffice. 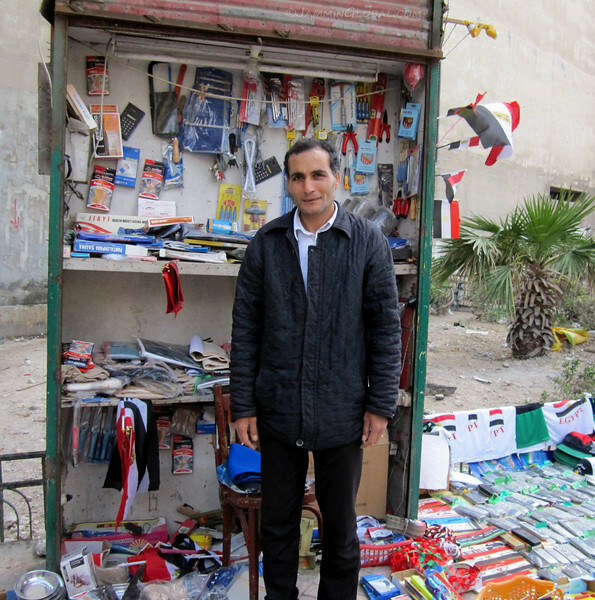 With no other option, I took his reassurance and left, content with being illegally in Egypt. …cat rummaging through for food. He blends in quite nicely. 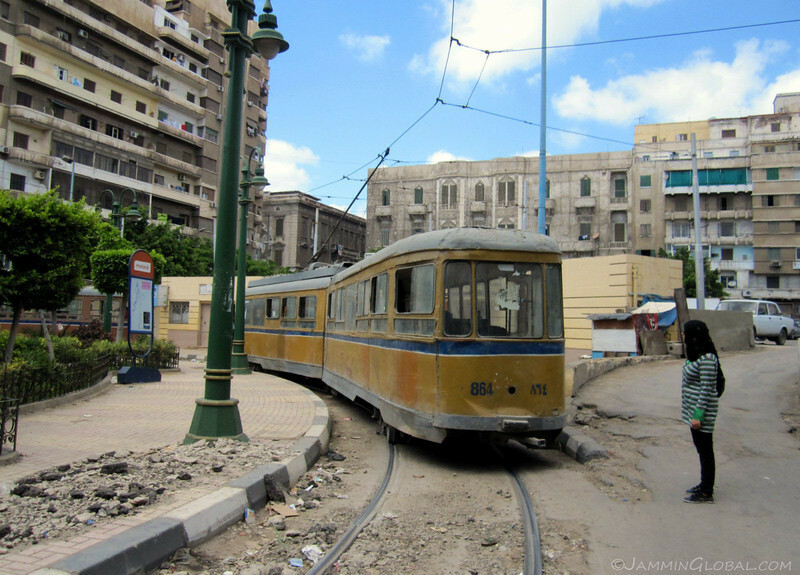 Alexandria has two tram lines (this is the Al Madina line) and they look just as dusty as the rest of the city. But it does its job of getting people around for cheap. A single fare costs LE 0.25 (4¢). 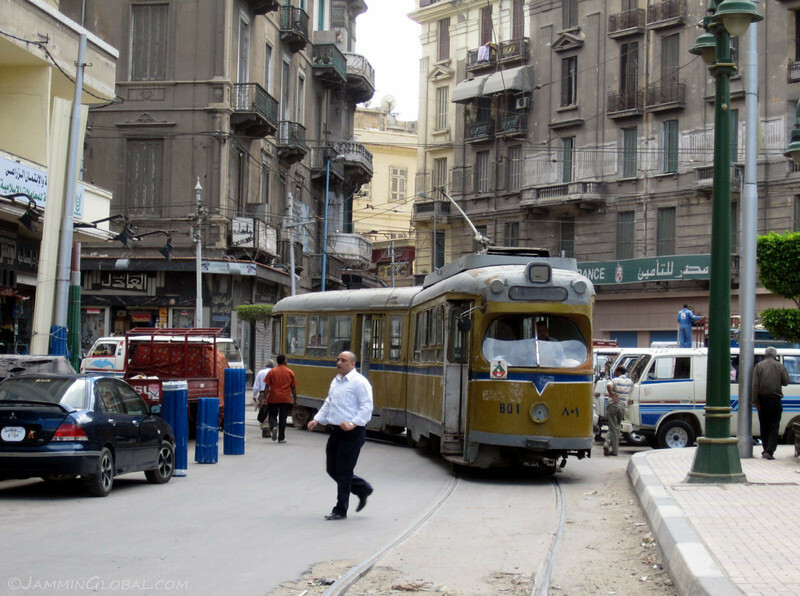 It is one of the oldest still functioning tram lines in the world, operating since 1860. The tightly packed buildings made me think of Paris and perhaps the influence is from when the French were here. Time for lunch and I spotted this mobile fuul stand. The big pot, a qidra, is constantly heated, keeping its stew of mashed fava beans ready to be dished out in bowls. 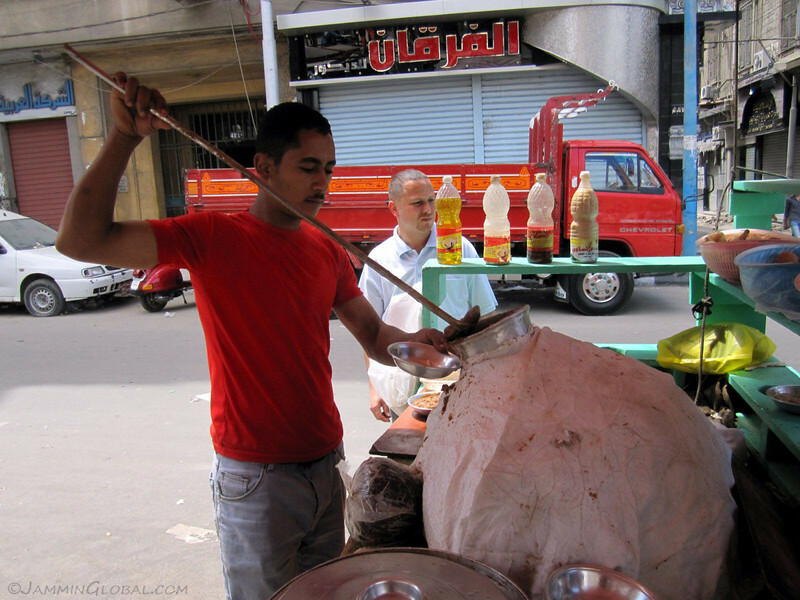 More than falafel, fuul is considered the staple food of Egyptians. It’s been part of the staple since Pharaonic times. The beans themselves are unflavored, but that’s what the various bottles of condiments are for. There was olive oil, garlic, lemon juice and other tasty toppings. 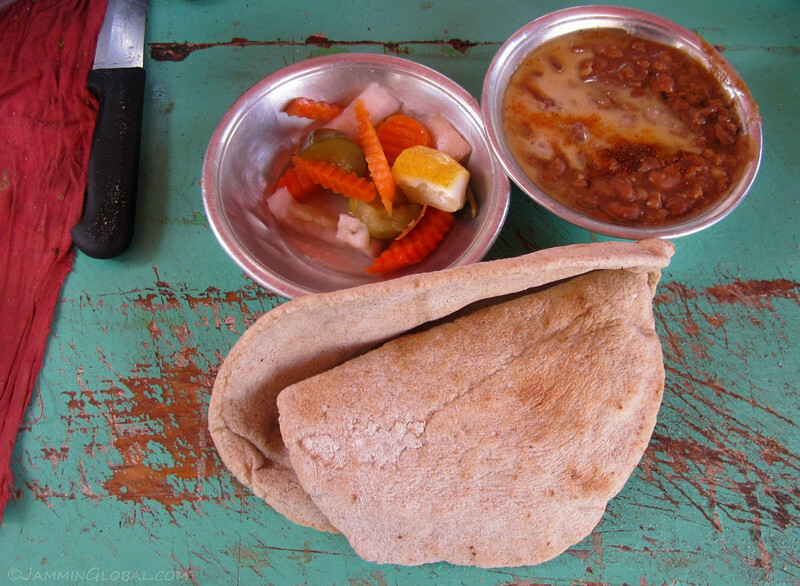 A simple lunch of fresh eesh baladi (Egyptian flat bread) with some seasoned fuul and a side of pickled vegetables. Note how the bread is just served on the table; time to add some local germs to the immune system. This lunch cost just LE 1 (18¢) and is the cheapest meal I’ve had on this trip, so far. 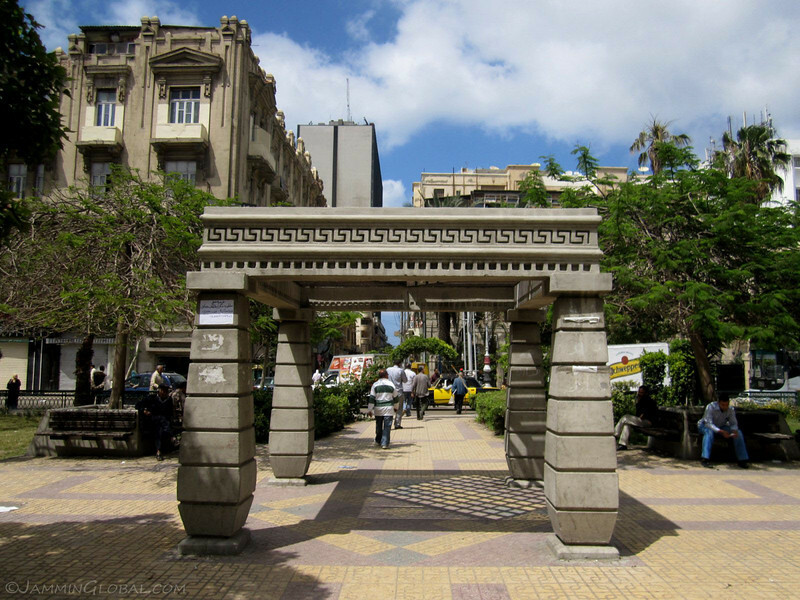 A small park with old designs in the heart of the city. 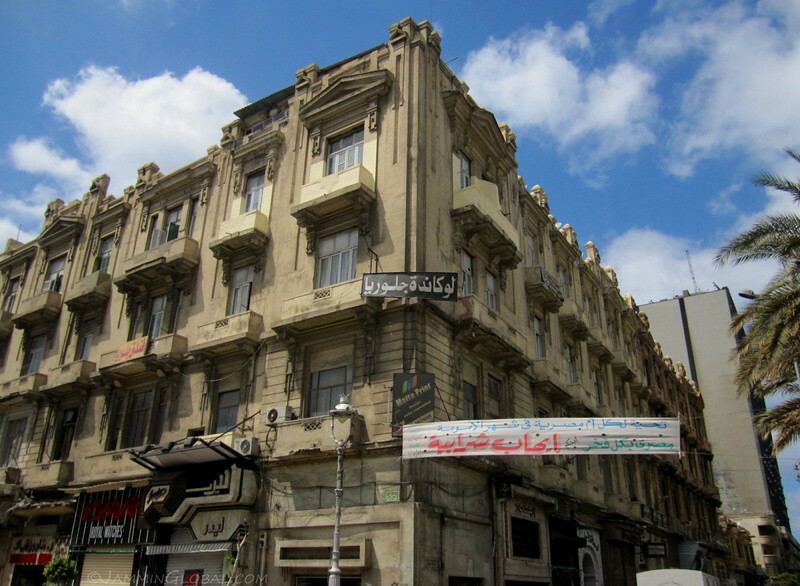 Besides the new crop of skyscrapers, most buildings in Alexandria look like this: brown in color and about 3-4 stories tall and usually spanning most of a city block. Again, resembling the Haussmann style of Paris. 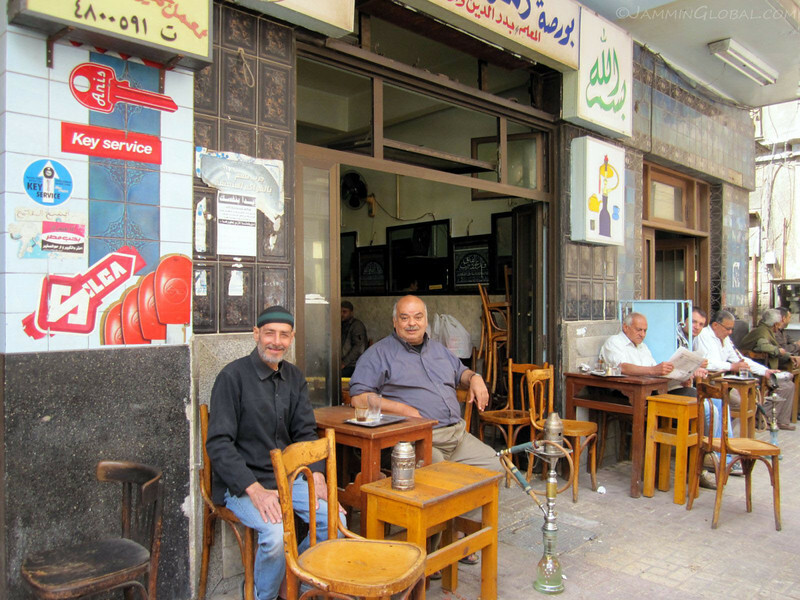 These friendly men in an ahwah (Egyptian coffee house), smoking some shisha, were more than happy to have their picture taken. It’s very much part of the culture to take things slow and catch up with friends over some hot coffee or tea and flavored tobacco smoked through a hookah. 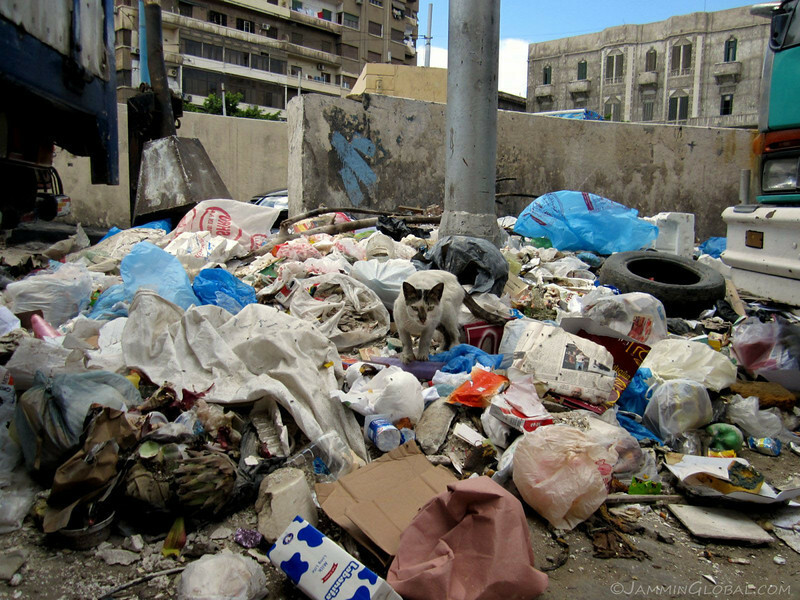 Garbage scene again, with a recycler going through the containers for anything valuable to sell. 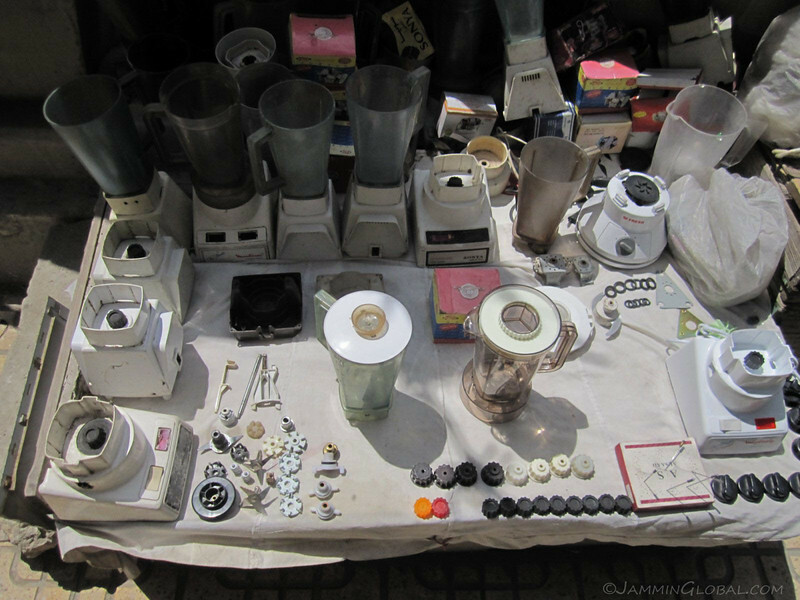 A sidewalk store specializing in all things blenders. From complete used units down to every single moving part in a blender. You can’t get this kind of parts choice in a regular store. This vendor of assorted goods sold me a lower back support (I lost my original one in the winds of Patagonia). He’s standing in front of the little structure that gets locked at night with all his wares. 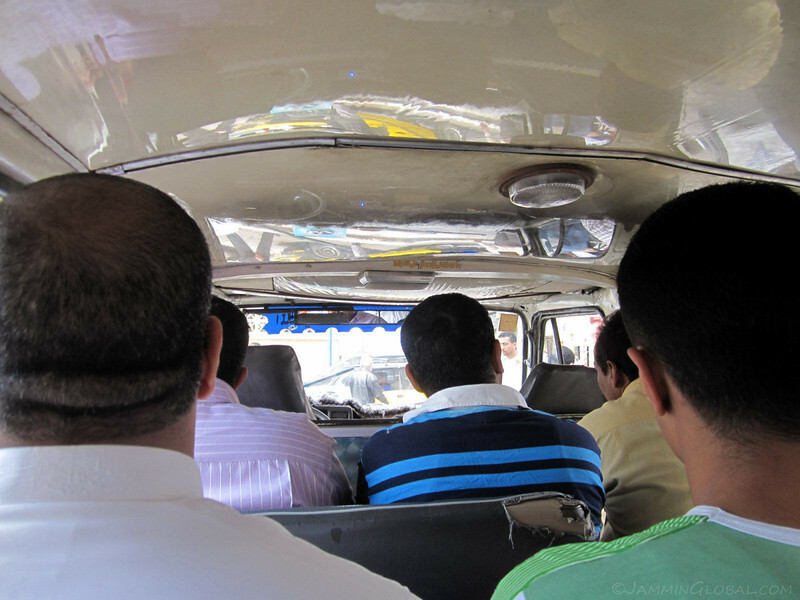 After my day in the city, I took a minibus back to Manuel’s place near Green plaza. This is the standard mode of public transportation and fares cost about LE 1.25. 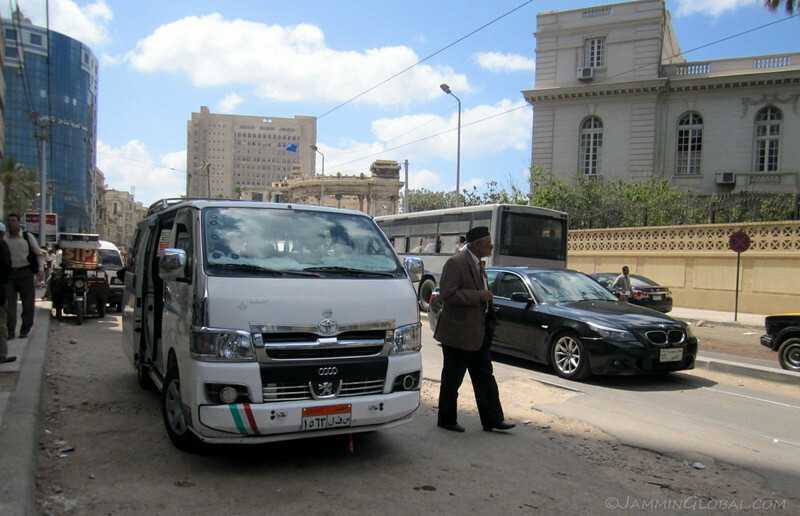 I like the contrast between the minibus and the BMW 5 series, representing the socioeconomic range of Egyptians. Inside the minibus and noting how this could be a scene from India. Egyptians look very much like Indians and within my first day here I was told that I looked like an Egyptian or North African. Excellent. My tactic of blending in wherever I go was going according to plan (only when I’m off my bike, that is). A tour of the city from the minibus. 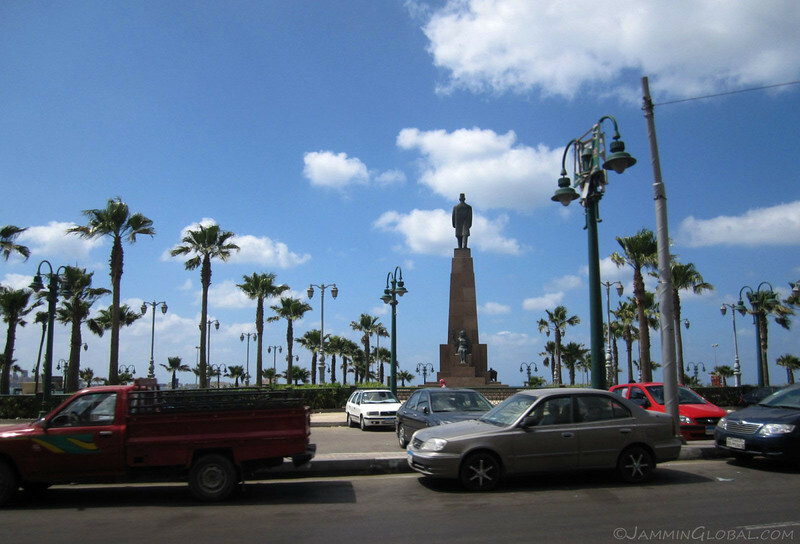 A palm-lined park along the corniche by the sea. 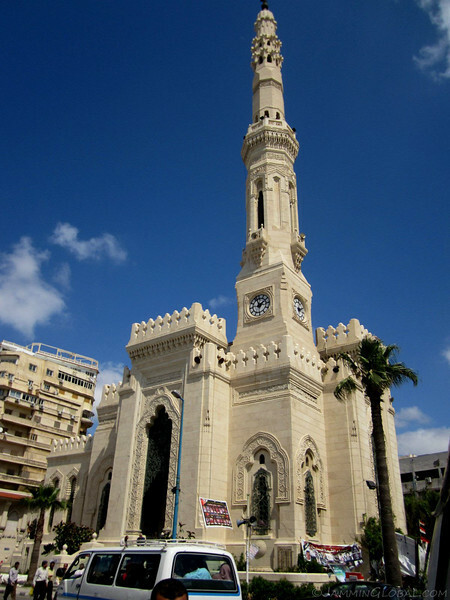 The Mosque of Abu al-Abbas al-Mursi, originally built in 1775 by Algerians over the tomb of the patron. It was rebuilt in 1943, giving it a gleaming new look. Hanging onto old ways, women are not allowed inside. Taking the ring road highway around the city that was named after Alexander the Great, the Greek commander who stretched his Macedonian Empire from the Adriatic Sea to the Himalayas. There are about 20 cities named after him. He died only aged 32, but his name is emblazoned in history for the spread of Greek culture (and its philosophies) and his brutal military tactics. His weakened army threatened to mutiny against him just as he was about to enter the Indian subcontinent in 327 BC. 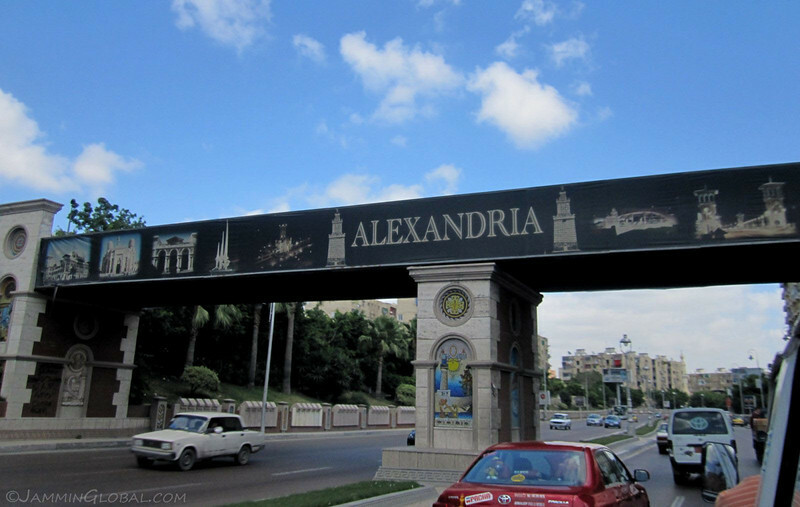 As the name ‘Alexandria’ has too many syllables for quick conversation, people in the know refer to the city as ‘Alex’. 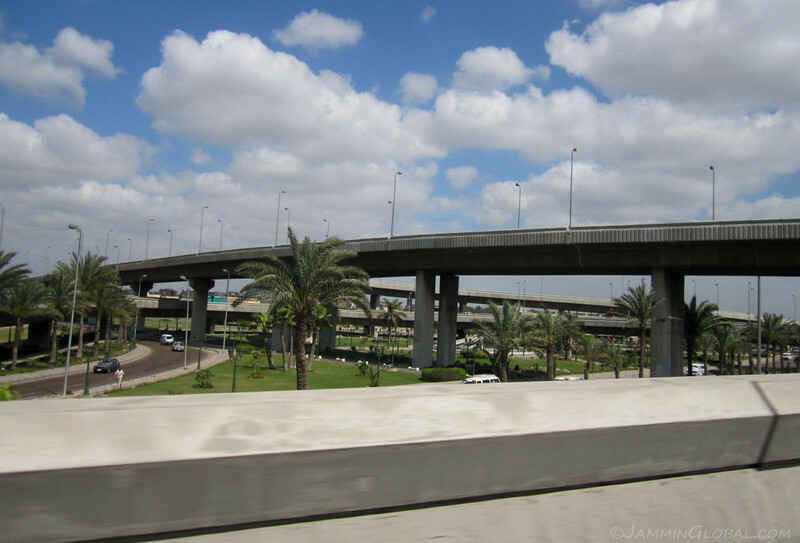 A modern flyover interchange, which I would be taking the next day on my way to Cairo. 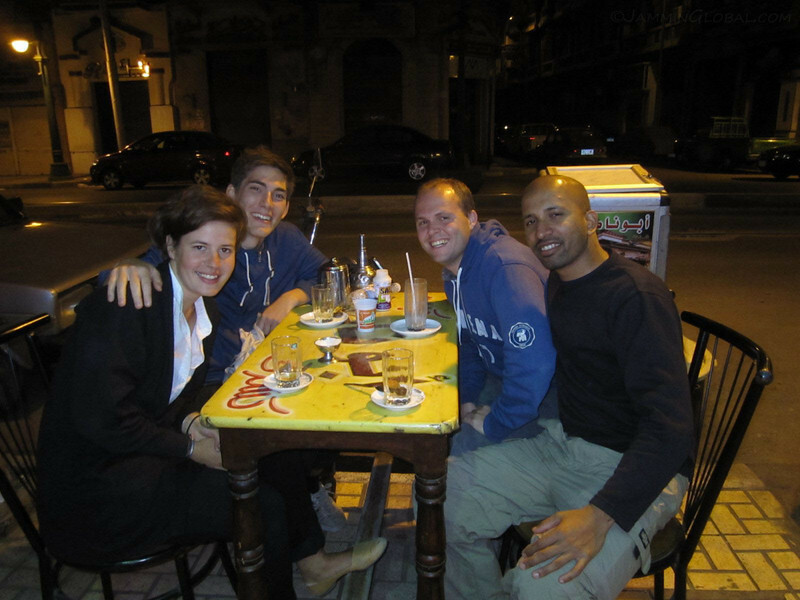 That evening, I went out with Manuel to meet some other CouchSurfers for dinner. 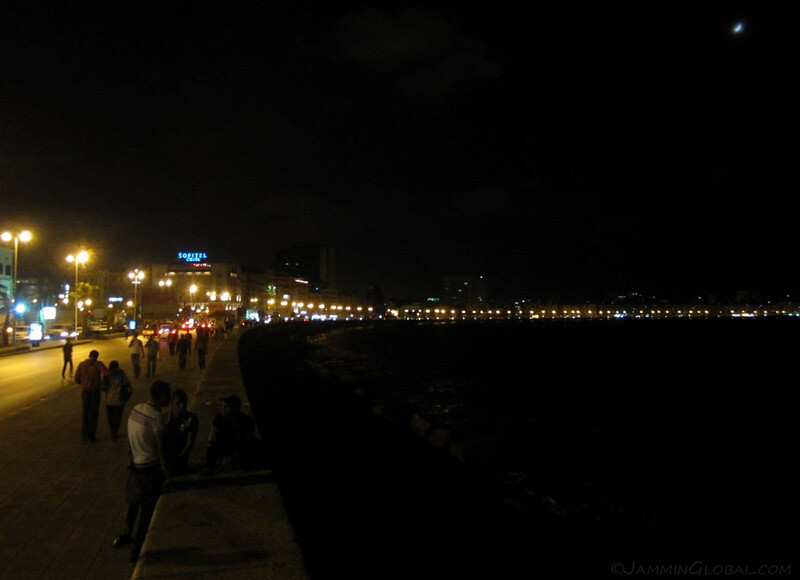 This is the corniche at night, providing a promenade for friends and couples. Note the half moon high in the sky. 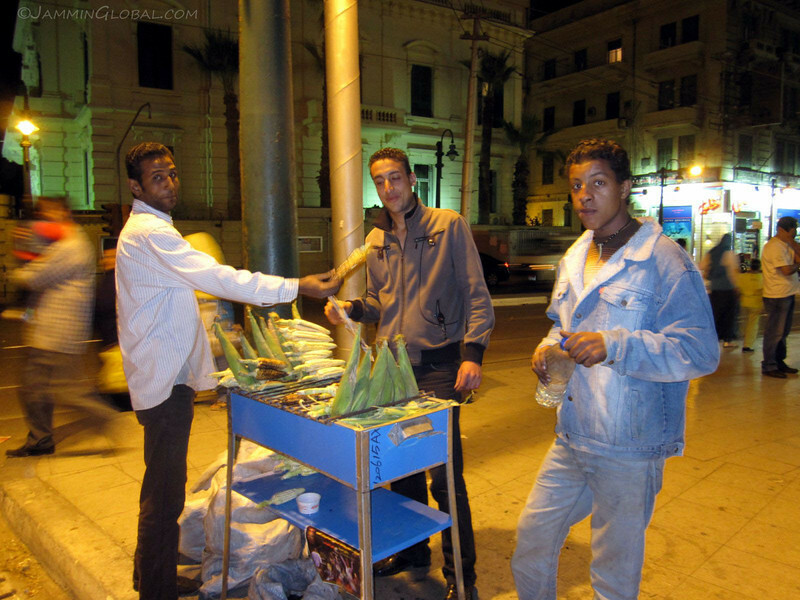 Freshly roasted maize for a quick street snack. 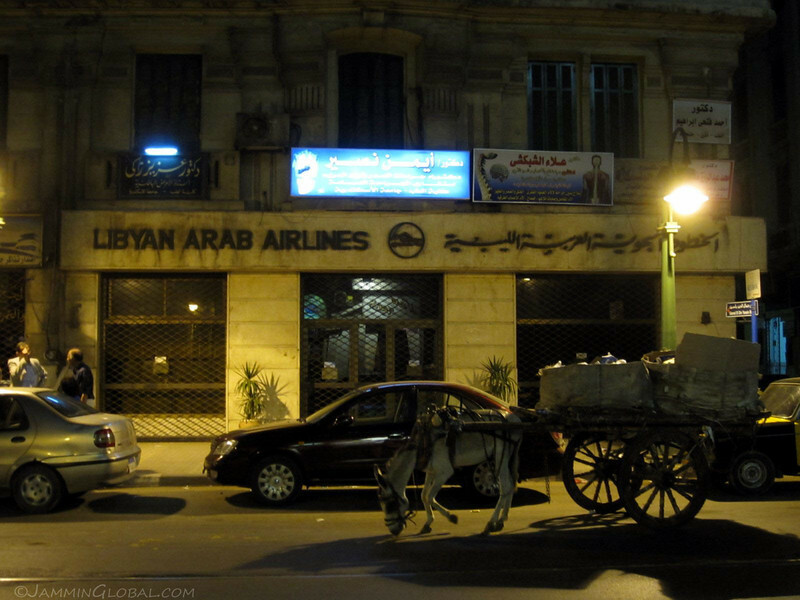 The closed office of Libyan Arab Airlines, which was grounded following the start of the Libyan revolution in March of this year. The donkey cart in front symbolizing the tried and tested mode of transportation in this part of the world compared to the new, instant (by comparison) transportation by aeroplane. Meeting up with Ylva and Felix from Sweden, CouchSurfers who were here to study Arabic. They had traveled on a timber-carrying cargo ship from Finland to Alexandria and were envious of my four week journey across the Atlantic. A bowl of wholesome goodness: rice with macaroni, chickpeas, lentils and seasoned with fried onions and garlic. 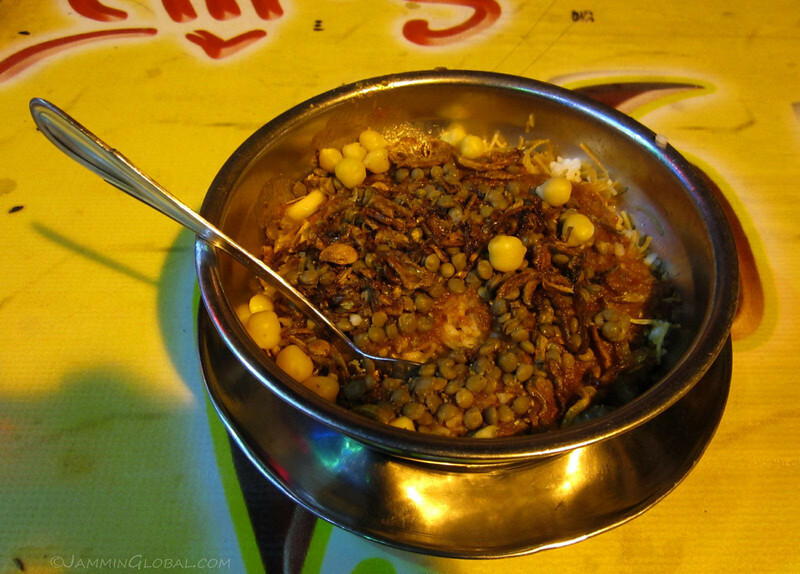 This dish is called Kosheri and is another staple of Egyptian food. It looks like a chef threw together whatever was left in the fridge one day and it became a hit (my kind of cooking). It tastes excellent and is a filling meal for LE 5. The concept was introduced to Egypt by British soldiers coming from India, where we have Khichdi, a comfort food of rice and lentils cooked together. 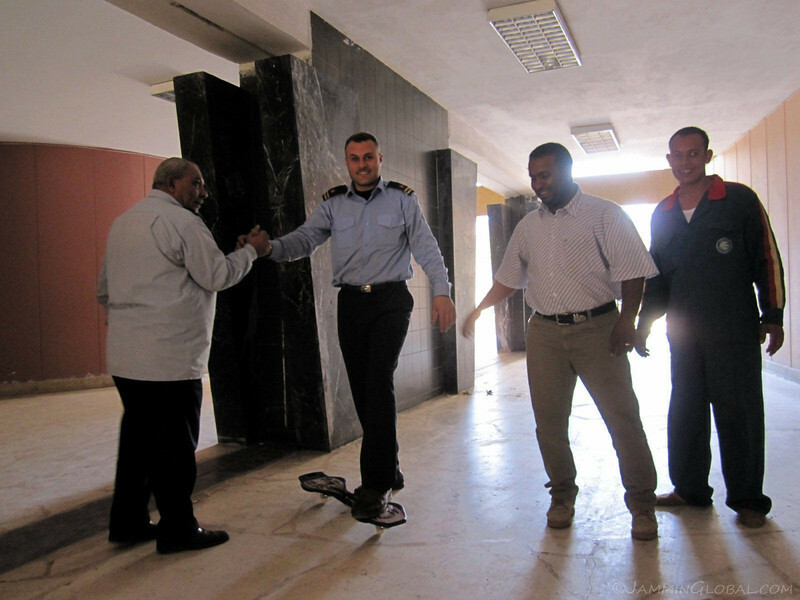 The next morning, the guards at Manuel’s apartment block wanted their picture taken as they tried this new type of skateboard with just two wheels. I was feeling the jovial Egyptian spirit that I had heard about and was happy to relinquish the sour experience of the Egyptians at customs and immigration. 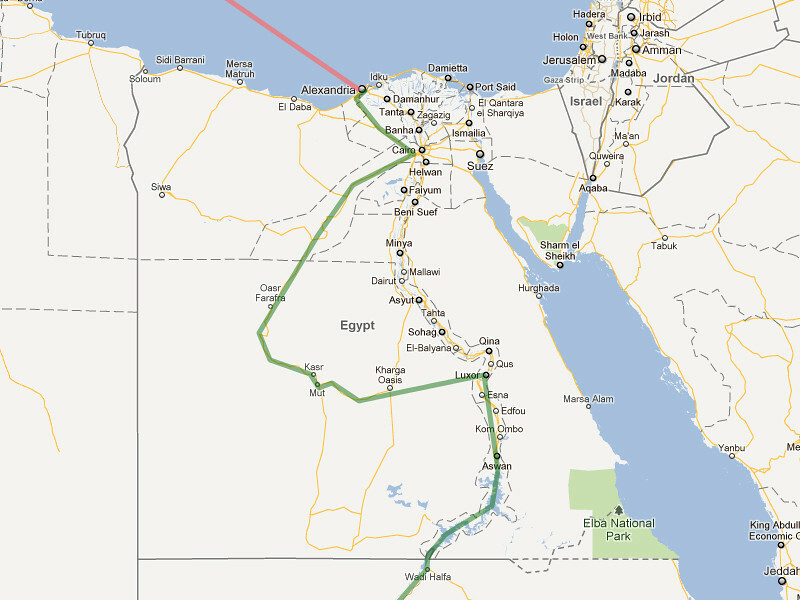 My route map through Egypt, starting on the northern coast in Alexandria, heading thru Cairo, then onto the Oasis Route through the Western Desert, down to Luxor and exiting at Aswan. Click on it to go to the interactive version in Google Maps. 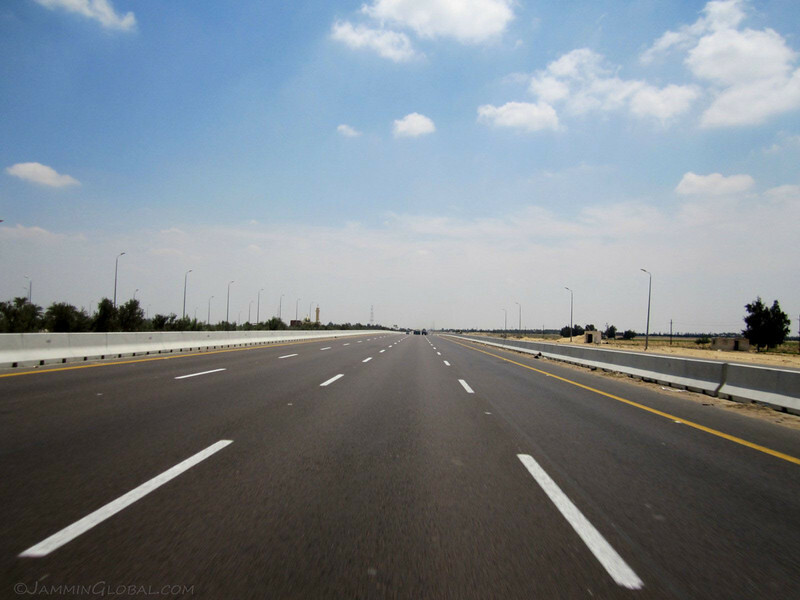 With a good mood about the people, I set off from Alexandria on the new Desert Highway to Cairo, 200 kms (124 mi) away. 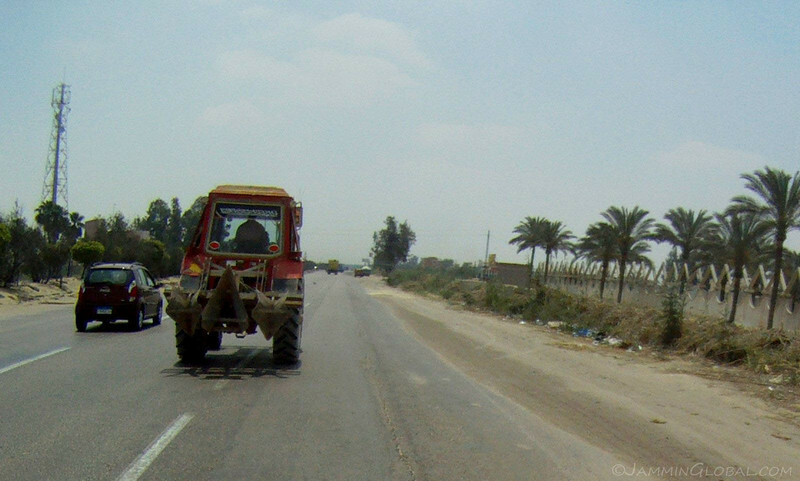 There’s an older Agricultural Route that passes through all the small towns of the Nile Delta, but I heard the traffic was intense with crazy drivers. The crazy drivers were on this road, as well, but at least there were two or more lanes on either side. In a place where helmets and safety gear are not required, I look completely out of place, from outer space, but I told myself not to compromise on bodily safety during this trip. This wasn’t the Agricultural Route, but nobody told this tractor, who’s driving like he owns the road. Note the cell tower. Even though the highway went through some remote desert, there were cell towers every few kilometers. The digital divide is slowly being bridged. Stopping for a break and noticing that my recently installed adjustable sidestand was working itself loose. After some water, I got ready to get going again and here you can see the contents on my left pannier as I strap in my kidney belt to aid in lower back support (wish it was black). My sandals are the last items to go in so that I can use them to keep everything else from rattling about. 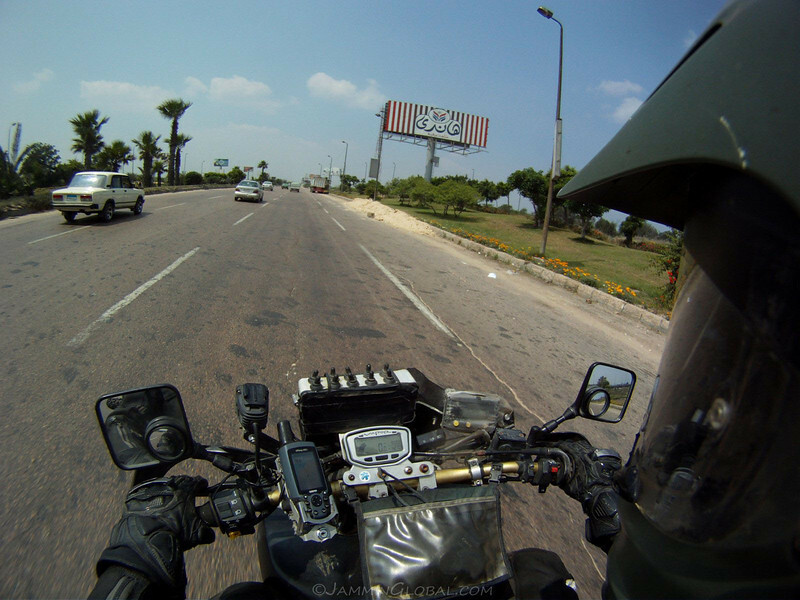 Coming across a toll booth and happy to note that motorcycles don’t have to pay tolls in Egypt. Yeah. 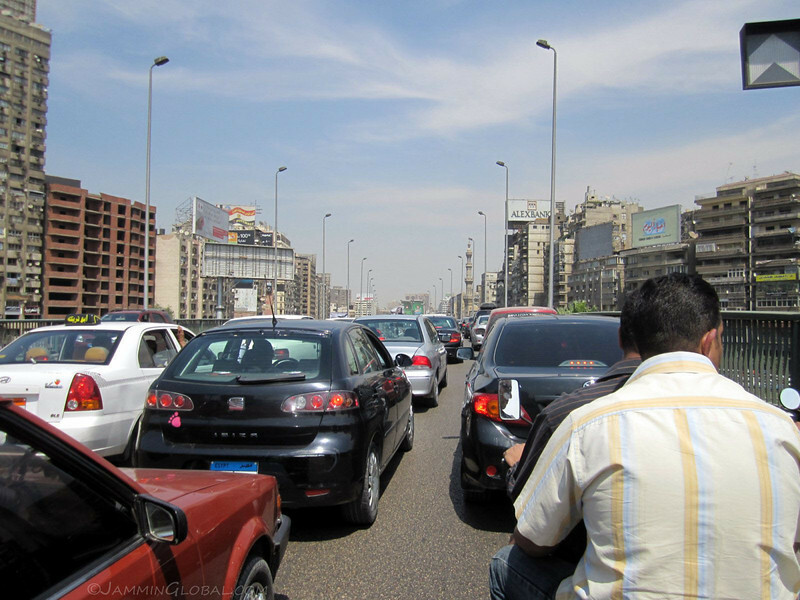 …chaos of traffic in Cairo. I arrived in the capital within a few hours but it would take another hour to find my way to Maadi and my next CouchSurfing host. 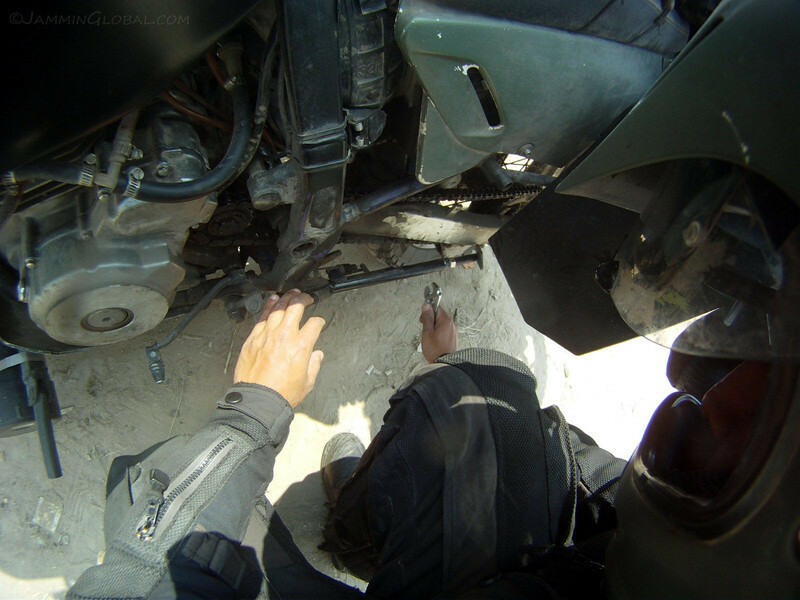 I had the Tracks4Africa GPS maps in my Garmin, but they’re lacking detail for northern Africa, especially in big cities, so I had to resort to the usual way of stopping and asking for lots of directions. 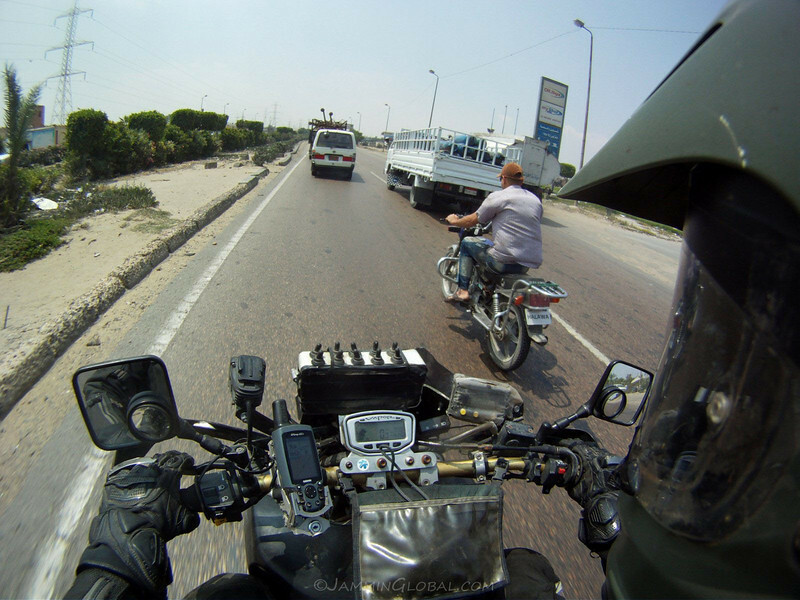 Being inland from the coast, Cairo was noticeably hotter than Alex and while my heavy meshed-gear is efficient at keeping me cool while moving, I quickly heat up in traffic jams, along with the air-cooled motor of sanDRina. The roads here are barricaded by concrete walls and once every last inch is taken up by traffic, things come to a halt. This is marked as a two lane bridge. There was no alternate route as every road looked like it too was jammed. 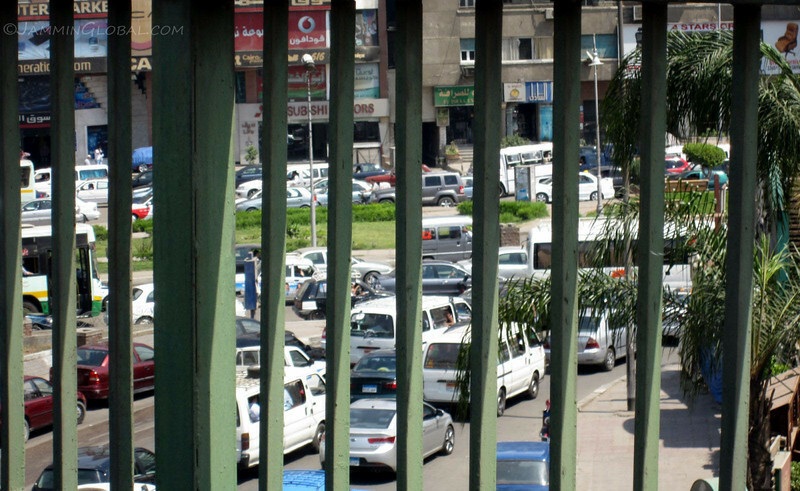 This image through a steel barricade best represents the feeling of being trapped in traffic. I wish I could’ve spent a few more days in Alexandria but I think I got a good taste for the city. 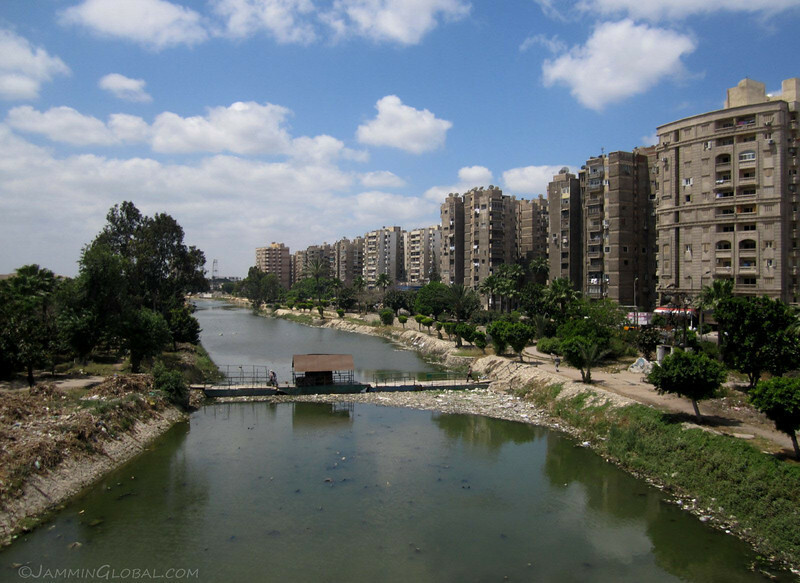 I had made it to Cairo and now the mission was to get a visa for Sudan, then I could relax and take in the city and its sights. Salam, thanks for your nice comments. Yes, I like to show the reality of the places that I am traveling through. I wish I had more time to explore Alexandria. I will be back again to experience your wonderful city. Cheers. The picture is of the Qaid Ibrahim Mosque. It was built between 1949-1951 by the Italian architect Mario Rossi. It was built for the centennial celebrations for the great Ibrahim Pasha, the son of Mohammed Ali. And … women are allowed inside mosques in Egypt. Oh god, don’t get me started on Cairo rush hour! I’ll never stop being grateful to our reckless driver who got us to the airport in the nick of time after spending tooo much time at a perfume shop. Read all your Atlantic & Europe travel reports today and I’m looking forward to reading all the rest in the coming weeks!